Programmers must be practicing independently to get paid hourly per terminal by domain registrants. Programmers make no ordinary persons. They are the force to reckon with. GPL has made them that kind of a class. So neither that should keep them unemployed nor they should be doing anything else for livelihood. Sangkrit has reasonably resolved this question forever. Now programmers must be practicing independently to get paid by domain registrants hourly per terminal for their GPL code. They should not be signing any NCNDs with any corporation or other entities since the code that they create under GPL is the only way to keep them social. 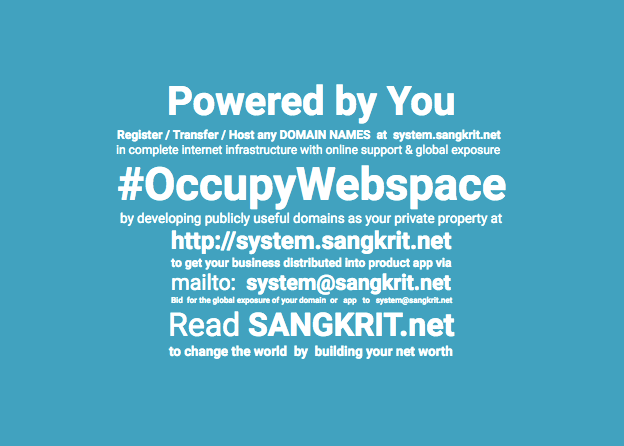 Everybody should signup for free sangkrit.net account to bring everybody’s business online. This makes the best self-employment for everyone and every programmer should be working professionally among them to get paid hourly per terminal. That is the greatest concurrent choice of individual. Thus people work as personal outlet of the globally distributed order of sangkrit.net and just like everybody else, professional programmers also work as personal outlets. So that they can commercially satisfy many requirement of coding whenever asked by other personal outlets. Everybody should make such a free sangkrit.net account to help others. That should now become everybody’s hobby. Cooperation is the new buzzword that builds the greatest commonwealth of codebases under GPL to support humanity through internet age. GPL integrates professional programmers to let them emerge as vanguard of world revolution within this movement to occupy web-space by humankind. Nothing else integrates them that much. Not even Richard Stallman himself. Next generation of programmers are getting trained while functioning as personal outlets of sangkrit.net as practicing programming is purely online business. They learn on internet practicing necessary programming languages to work for domain registrants and receive payments in their net banking account. They keep the four freedoms intact. That helps the growth at personal outlets. Your free sangkrit.net account is your admission into this and your net worth at any point of time is your instant dynamic result that changes as well with your caliber. Previous PostGenerating Free Automated Website Backups At SANGKRIT.netNext PostHow To Force SSL By Editing .htaccess file On Your Website?